The passengers arrived at La Spezia on 8 April 1946 and were blockaded by the British. 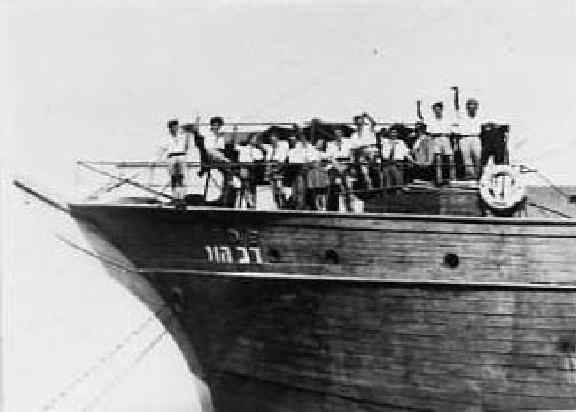 Yehuda Arazi exploited the situation, and organized a hunger strike, then threatened to blow up the ship. After a truce, the British finally gave in, the passengers were given permits and arrived legally on Fede and Fenice. Refugees included 167 partisans from Poland, members of pioneer groups and ultra-Orthodox Agudat Israel, and 12 children. By this maneuver, Arazi gained world-wide publicity for the plight of the Jewish survivors. Name: Dov Hos (1894-1940) was a founder of the Haganah.